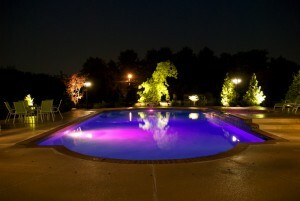 Stay safe during night swims with LED pool lighting systems. Don’t leave your brand new swimming pool in the dark this summer. Even though the days are growing longer, you don’t want sunset to dictate the end of your nighttime swim. Keep the party going — or enjoy the serenity of the water at night for a solo night swim — long into the evening with LED pool lighting systems. The LED pool lighting systems that we offer here at Paradise Pools are capable of both adding safety and setting the party scene. Let us explain. Safety is obviously a significant concern around a pool, where a variety of accidents can happen, so safety is the primary purpose for pool lighting. 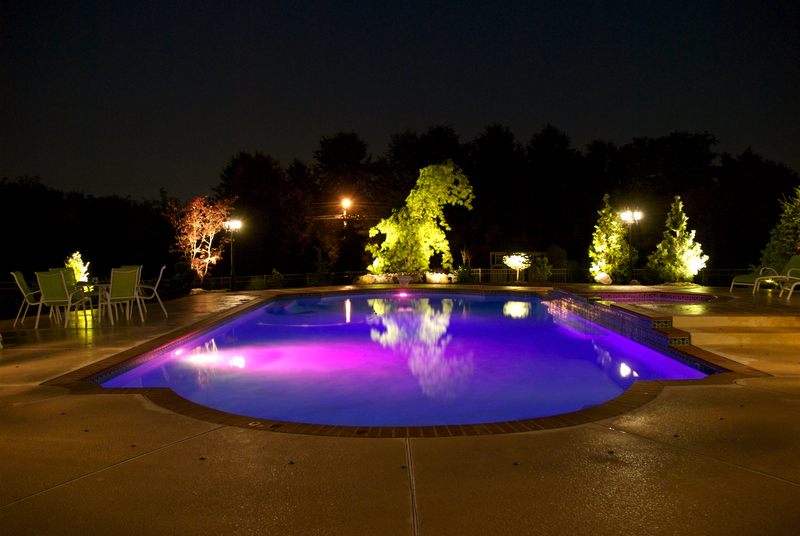 LED lighting in your pool makes it safer to swim without bumping into walls or other swimmers. Also, if you have children or other family or guests swimming at night, in-pool lighting lets you keep an eye on them in case anything goes wrong. Oh, by the way, LED lights are magnificently eco-friendly, using up to 90% less energy than halogen lights, therefore lasting longer, and costing you less for replacement. One of the great perks of the LED pool lights that we offer is that many of them are available in a variety of colors, or even as color-changing models. Standard, white lights reflect through and off of the water, creating a glimmering ambiance, while color changing lights can set the mood for any occasion. (Can you say red, white, and blue for Memorial Day parties next weekend?) With the flick of a switch, turn on the party. The magic doesn’t stop underwater though, because we also have pool lighting systems to illuminate the area around your pool as well. Safety reigns supreme again, lighting up potential trip hazards or other dangers. But the party keeps rolling as well, lighting up your pool deck and your surrounding landscape and hardscape, making your pool area the place to be when the sun goes down. This entry was posted on Friday, May 20th, 2016 at 1:53 pm. Both comments and pings are currently closed.